This week’s reading is titled “Introductions.” We had our introductions to what the Bible is with brief readings from Hebrews and 2 Timothy. When you read the passage in Luke you get an introduction to a way in which we can read the Bible. Jesus himself shows us that throughout all of Scripture we see him. He instructs disciples soon after the resurrection using the Old Testament and reveals all that those books say about him. Jesus didn’t come into the picture of God’s great plan late in the game. Jesus Christ was always the plan–before this world was even made we were chosen in him, as it says in Ephesians 1. Then we turn to Genesis and are introduced to creation. Genesis has two accounts of the creation with the second one coming in chapters two and three. There we are introduced to the greatest of God’s creations, human beings, but then quickly we see how far we fall. God made us and gave Adam clear instructions for how to live in the garden alongside God. But temptation comes when the serpent questions God’s word. “Did God really say that?… Oh, you won’t really die if you do that.” Adam and Eve do not believe the truth of God and believe the tempter. They exchange truth for a lie. The serpent wasn’t even holding something out that was an obvious treachery. The promise was for something akin to wisdom; it was to be like God. But in their pursuit of something good in the wrong way, they sin. And with sin there is consequence. There is shame, there is alienation, and there is curse. Although God is the one who is wronged, he still seeks to provide even in the midst of passing out judgment. God is the one who clothes his children and he then in chapter three of Genesis promises one who will come for the serpent. Many see Christ as the offspring who will bruise the serpent from Genesis 3:15. At the end of this introduction Adam and Eve are cast east of Eden, out of the garden and its gates are shut to them, with angels guarding the tree of life. What is next for them? Has God rejected the pinnacle of his creation, leaving humans on their own on earth? The good news that we know is that God does anything but leave us. God would one day come and be among us and there would be another tree of life. And on that tree Jesus Christ would die for us, giving us his very own life–a life abundant and eternal. With two of this week’s passages we are reminded that the Bible is God’s word, and that idea carries great significance. What God has to say to us, in its entirety, isn’t always something we want to hear. But it is what we need. If we’re familiar with Scripture we may turn to passages that we already know and like in order to find some word of encouragement. We may want to hear how God blesses his people and then turn to see what great blessing Solomon received or see how Jesus heals the sick. But how often do we want to read how those who were so close to Jesus, his disciples, didn’t always receive the sort of blessings we want and instead had lives of pain and suffering? It seems we have a tendency to seek out what we already believe. We aren’t always in search of truth, but we are in search of confirmation–confirmation of what we already think we know. You can turn on the TV or visit websites that you know will spin the news and report events in the way you like. It can be as innocuous as preferring to listen to your own local commentators while watching a sports game. I know I’d prefer to hear people who get at least a little bit more excited when my team scores. But it can also cause us to stick our heads in the sand. When all we hear and read is a carefully selected to never push us or confront our views, then we get very comfortable and also prideful. We make ourselves the judge of what is right. When we are so selective in the way we take in information it leads to confirmation bias. With confirmation bias all we do, in the Bible and elsewhere, is look to reaffirm our ideas–which is to say, we try to reaffirm ourselves. But as Christians we must know we are sinners. We make mistakes and get things wrong. We can’t assume we know everything and have it all figured out. At times God will confront us. He will challenge what we believe. And that’s good. God is God, and we are not. His ways and his thoughts are not like ours. There should be times when we are pushed and have to change our views and actions in order to align with what we read. 2 Timothy 3:16 doesn’t say “all Scripture is profitable to comfort us in down times.” God’s word may do that. But it is profitable for the hard things, too, like reproof, correction, and training. We just need to be bold enough to first open the Bible and humble enough to listen for the Spirit to continue to speak to us through it and work upon our lives–even when that means we are convicted and challenged. Dare we read the Bible? I have had a lot fun scratching my visual arts itch in putting together our plans for Year in the Bible. I’ve used several logos in the past and I leaned heavily on trees early on, inspired by Psalm 1. When we delight in God’s Word it is as though we are a tree firmly planted by streams of water. But I continued to experiment and went with a more abstract visual that mixed the letter ‘y’ (from year in Year in the Bible) with an opened book. At least that is what I hoped it had looked like. 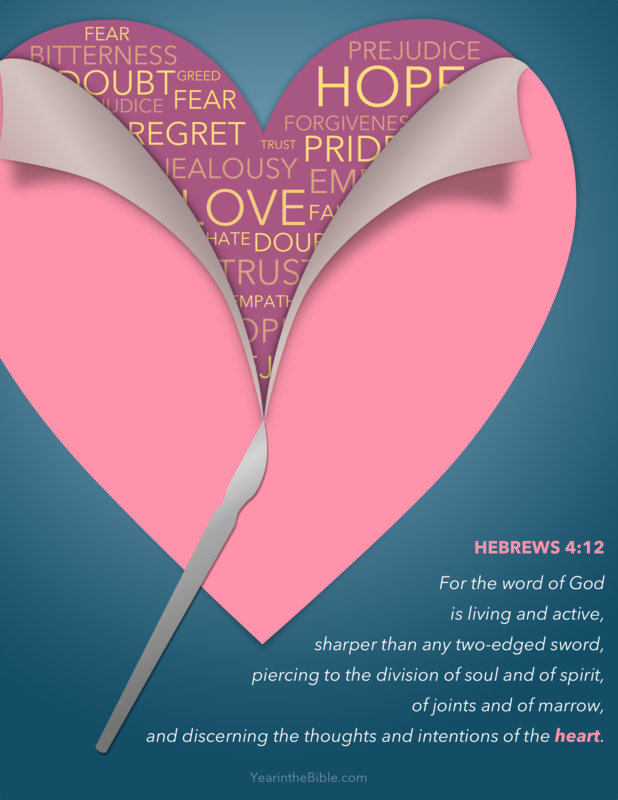 …the word of God is living and active, sharper than any two-edged sword, piercing to the division of soul and spirit, of joints and marrow, and discerning the thoughts and intentions of the heart. My hope in this new reading plan is to see the plans of God that find their fulfillment in Christ all throughout the Bible. And as we read, doing so in humility and prayer, I believe God will use his Word to pierce our hearts. He can speak to us in a way that shakes us to our very soul. Such a reverberation that penetrates us and awakens us to the ongoing work of Jesus Christ will surely transform individuals, families, communities, and churches. So if we believe that, do we dare pick up and read the Bible? Do we make ourselves vulnerable to that piercing work of God? Are we open to change? Or do we leave our Bibles on the shelf, afraid to see what God will show us? Our new reading plan begins Sunday, May 25th. 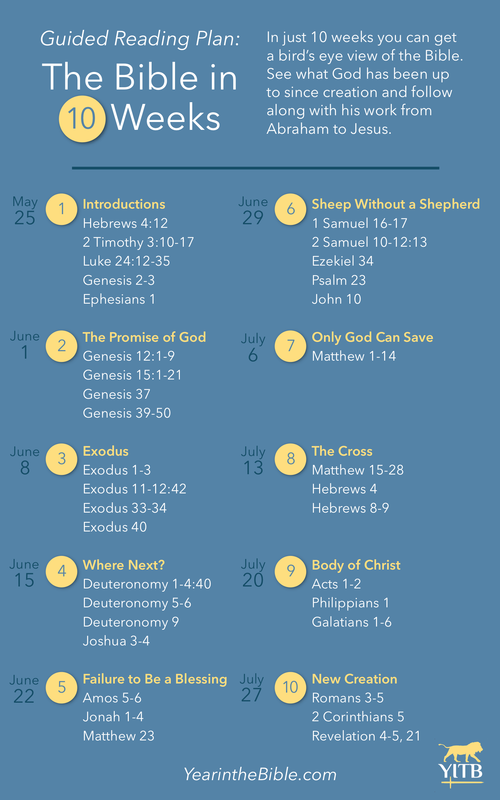 In only 10 weeks you get an overview of the whole Bible. While you don’t read from every book, this plan tries to give you a birds-eye view of what God has been up to with his people. You’ll see the promises God makes to Abraham, his faithfulness to Israel and their tumultuous relationship, and the way the promises are fulfilled in Jesus Christ. Since this plan seeks to be an overview, I’m hoping it will also work well as an introduction to the Bible for people who are wanting to know more about God in his word. Maybe this is perfect for someone who has never really read before. The readings for each week aren’t too extensive, so take your time and reflect on the readings.  We have a Bible study at our church on Wednesdays at 6pm, or you can find a reading partner or small group to discuss what you’re reading. Every Sunday there will be a short devotional to guide your study. Posts will also go up to help throughout the weeks. I’d love to hear that you’re reading along and how it is going, so feel free to email me, leave a comment, or otherwise contact me as we go along. I’d love to hear questions about the passages, comments, or suggestions!